Milli's Awakening takes its name from the painting Sleeping Milli (1911), in which expressionist painter Ludwig Kirchner takes an eroticizing and exoticizing view of his Black female model. But one instance in centuries-long history of Black people in Germany, “Milli” remains silent, speaking volumes about how Black women have been reduced to anonymous objects of desire. 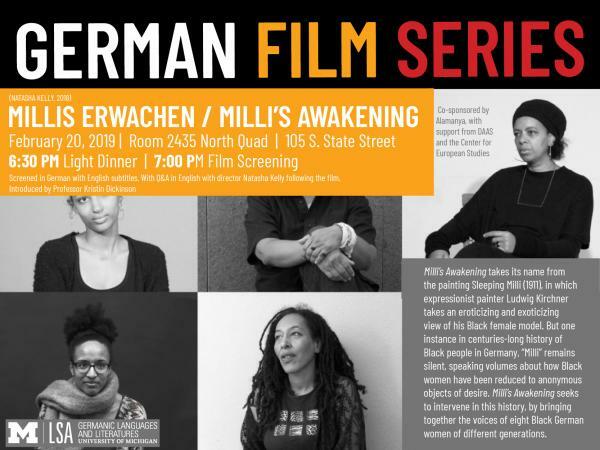 Milli’s awakening seeks to intervene in this history, by bringing together the voices of eight Black German women of different generations. Through their artistic practices they have defined self-determined positions within white German mainstream society. Like a quilt, the film unfolds in a way reflecting the diversity and interwoven nature of these (hi)stories. The German Film Series begins with a light dinner at 6:30 pm followed by introduction of the screening at 7:00 pm. **Screened in German with English subtitles. With Q&A in English with director Natasha Kelly following the film. Introduced by Professor Kristin Dickinson. Co-sponsored by Alamanya, with support from the Center for European Studies and DAAS.